It can always be hard to choose the perfect scent for someone else as a Christmas gift. The Leighton Denny Light & Dark fragrance collection has an ideal solution for this with their cute 5ml samples. These fragrances can either be worn alone or layered together to create a bespoke cocktail. The mini, refillable 5ml spray travel size it the perfect stocking filler! The orange bottle is ‘Original‘, one of the best scents for autumn. Pepper, myrrh and incense with gardenia, jasmine, lily and rose. This fruity combination is merging mandarin, grapefruit, peach and white pepper. A warm, welcoming, unique fragrance. Enclosed in Pink is ‘Delightful’. Not the scent for me, this is particularly feminine. Red fruits, lotus flower, mirabilis jasmine and pink violet. Sweet musk, creamy vanilla and coconut sorbet. There are two unisex aromas in the collection. The green container is ‘Lively’. With bergamot, lemon and grapefruit entwined with white florals, nutmeg, ginger, pepper and cardamom. Base notes of sandalwood, patchouli, vetiver, ambers and musk. Purple is ‘Desire’, the other unisex scent. This boasts a celebration of vetivert, patchouli and cedar of grapefruit, lemon, bergamot and neroli. If you love these samples bottles then it is also worth checking out Twist & Spritz. Twist & Spritz cost £10 and are a new easy to use atomizer. I hate carrying around a large bottle of my favourite perfumes. This is a great way to transport my perfume anywhere, whether abroad or simply popping it in my handbag. The range has 18 shades to chose from and can hold up to 8ML of fragrance (equivalent to 100 sprays). My husband always loves Molton Brown items. His favourite is from the new Russian Leather collection. The fragrance range is unisex, although for me it is a very male scent. He loves his Russian Leather Fragrance Gift Set with a shower gel and eau de toilette. Within the fragrance are notes of raw leather accord and brisk Siberian pine. Top notes found are elemi, black tea and purple basil. The heart notes punctuating through are Siberian pine, tobacco and birch. The aroma is finished off with base notes of vetiver, leather and cade. The gift set includes 300ml Russian Leather Bath & Shower Gel and a 50ml Russian Leather Eau de Toilette. From strong male scents to perfect feminine yet fruity fragrances! 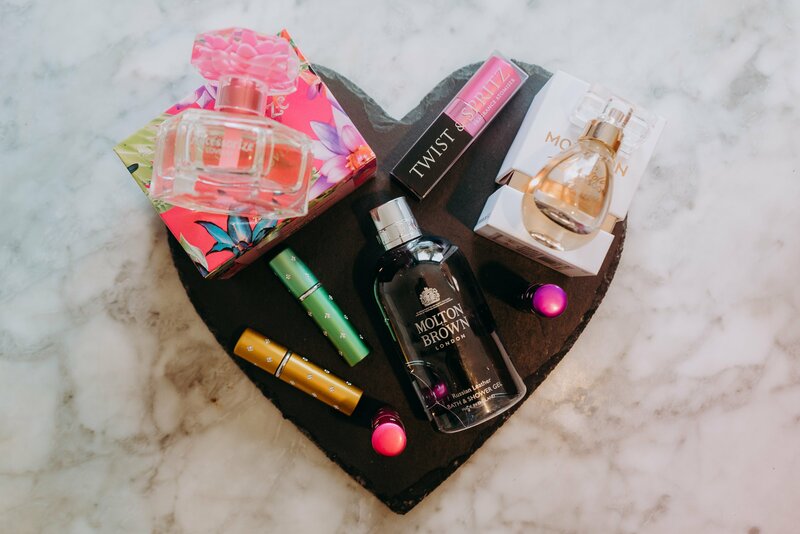 Accessorize LoveLily and Monsoon Rose Gold have been some wonderful additions to my perfume collection. Accessorize LoveLily comes in a pink and yellow, floral, hexagonal bottle. There are notes of raspberry, orange, lily of the valley, bergamot and sweet vanilla. Monsoon Rose Gold is a more elegant, rich scent. The perfume boasts feminine notes of lemon, tuberose, neroli, cyclamen and vanilla. A modern design for all rose gold lovers! What are your favourite autumnal scents?